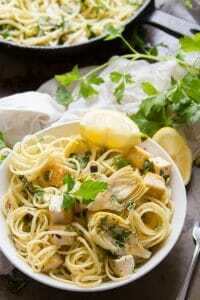 You don’t need seafood to make this scrumptious classic pasta dinner! 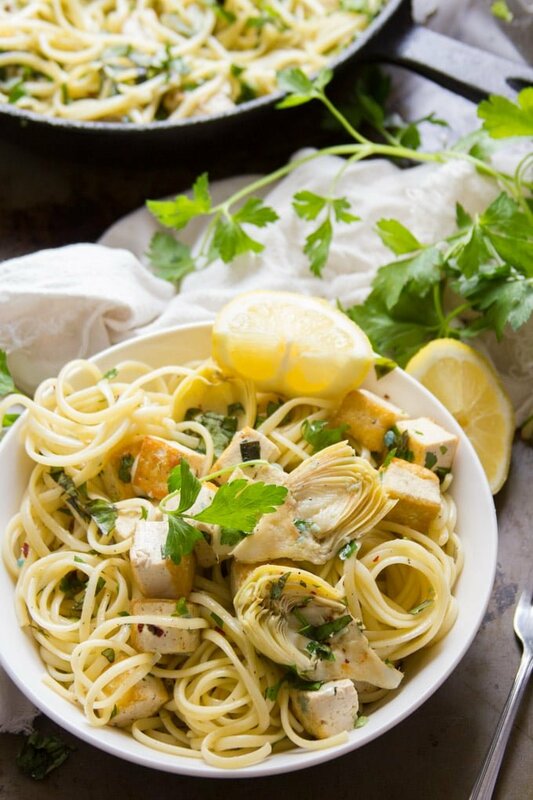 Pan-seared artichoke hearts, crispy tofu and tender linguine pasta are dressed in a lemon, garlic and white wine sauce to create this zingy and satisfying vegan scampi. Somehow, without intending, I’ve started working my way through the process of veganizing all of the restaurant dishes I served people while I was in college. Maybe not all of them. I’ve yet to figure out how to veganize prime rib, and yes, I served lots of prime rib back then, even though I was a vegetarian. The idea behind scampi is pretty simple: garlic, butter, lemon and white wine sauce. Of course I’d want to eat that without the shrimp! This version skips the butter too, using olive oil instead. You could probably use vegan butter in place of olive oil if you wanted. I bet it’d be delicious. Quick confession before you make this: I have no idea what shrimp tastes like. I’m not sure I’ve ever eaten one, but artichoke hearts have a seafoody feel to me, so I decided to go with them. My husband tells me they don’t taste like shrimp, but definitely satisfy whatever quality shrimp gives the original version of this dish, and that’s good enough for me. The tofu is in there for protein, and also just because I love the taste and texture of pan-fried tofu with a squeeze of lemon. If you’re not feeling the tofu thing, go ahead and use extra artichoke hearts, or throw in your favorite green veggie instead. Broccoli or asparagus would be delicious in this. This dish comes together pretty easily, but you’ll need to cook your ingredients in stages. First pan-fry the tofu. Next, out with the tofu and in with the artichoke hearts. Then the artichoke hearts come out and you simmer your sauce ingredients: garlic, white wine and lemon juice. Back in with the tofu and artichoke hearts, and in with some pasta and seasonings. Toss everything together. Check Barnivore to ensure your white wine is vegan. For extra seafoody flavor, try adding some dulse flakes. Watch out, because something crazy happend last time I made this: my garlic turned blue! (You can even see this in the pics and video if you look close enough.) Apparently this is totally normal. For extra texture, try freezing your tofu before cooking it. You don't need seafood to make this scrumptious classic pasta dinner! 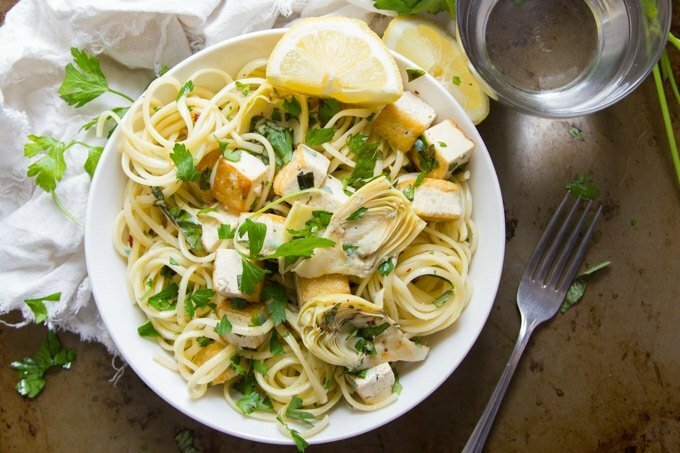 Pan-seared artichoke hearts, crispy tofu and tender linguine pasta are dressed in a lemon, garlic and white wine sauce to create this zingy and satisfying vegan scampi. Bring a large pot of water to a boil. Add the pasta and cook it according to the package directions. 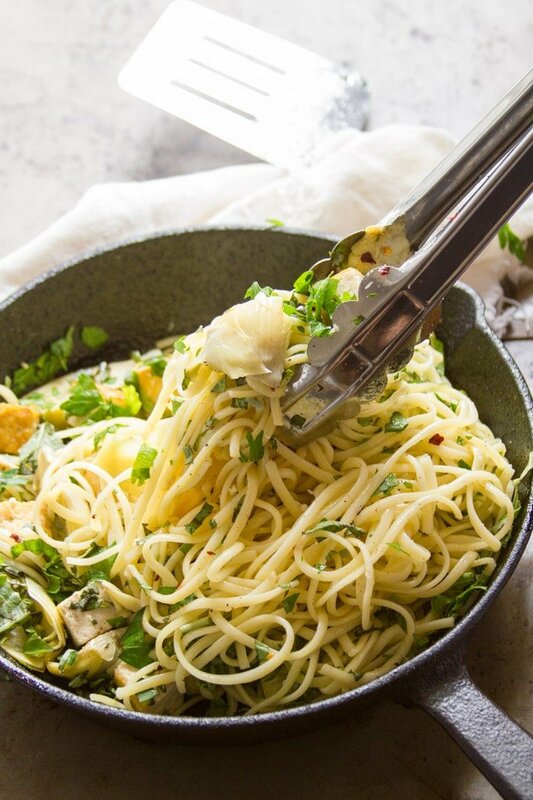 Drain the pasta into a colander and return it to pot. Toss with a few dashes of olive oil to prevent sticking. While the pasta cooks, coat the bottom of a large skillet with 1 tablespoon of olive oil and place it over medium heat. Add the tofu cubes and cook for about 10 minutes, flipping once or twice, until browned on multiple sides. Remove from the skillet and transfer to a plate. Add 1 tablespoon of oil to skillet. 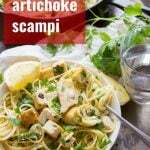 Add the artichoke hearts to the skillet in a single layer and cook until lightly browned, about 5 minutes. 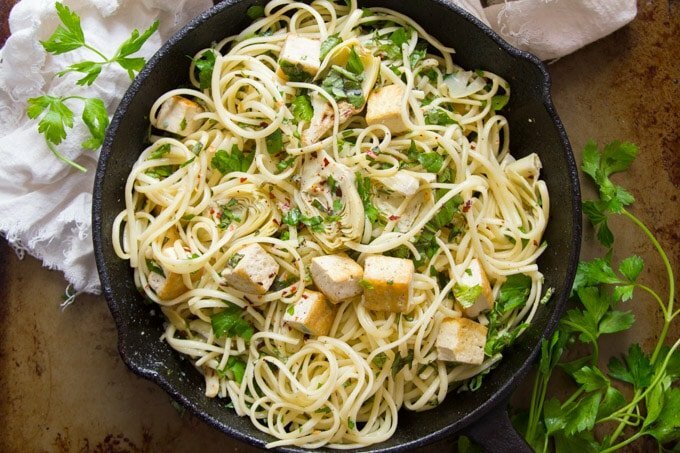 Remove from the skillet and transfer to the plate with tofu. Add 1 tablespoon more of olive oil to the skillet. Add the garlic and sauté about 1 minute, until very fragrant. Add the wine the and lemon juice. Bring the mixture to a simmer. Allow to cook until the liquid reduces by half, about 4 minutes. 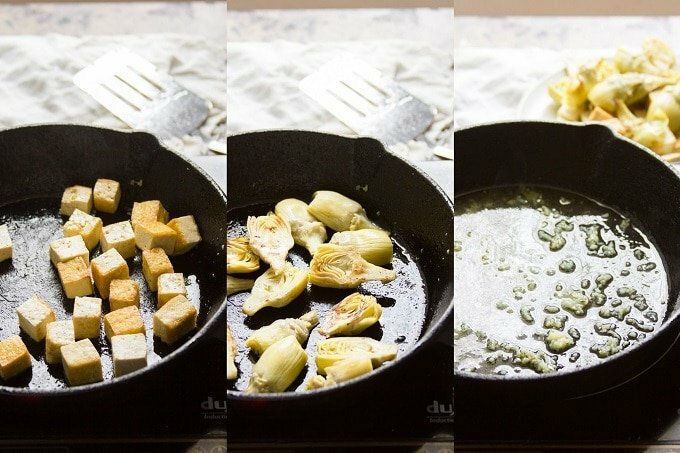 Return the artichokes and tofu to the skillet. Add the pasta and toss a few times, just until ingredients are hot and evenly distributed. Remove the skillet from heat and stir in the basil and parsley. Season with salt, pepper and red pepper flakes to taste. Divide onto plates and serve with lemon wedges and additional red pepper flakes. This is one of those recipes that looks too easy! I subbed asparagus for the tofu since it’s that season here in Germany and added a sprinkle of nutritional yeast on the second serving that really took it over the top. I was never a fan of shrimp anyway and my husband loves artichoke hearts so this was a big win from both of us. Is there something I could substitute the white wine with? If you’re trying to avoid the alcohol, I think vegetable broth would be your best bet. This might also be good with stems of trumpet mushrooms. Since them mimic scallops. This looks so tasty! 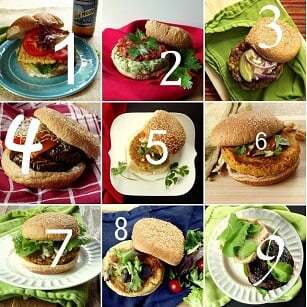 Love the addition of tofu for some added protein too! Too much oil. I will sub aquafaba. Mushroom stems are also used as scallop pieces. Some of these could also be added. Looking forward to making this. Thanks. With angel hair pasta, I am enjoying my delicious lunch. Thanks for the recipe. Angel hair pasta sounds perfect for this! Glad you’re enjoying it! !